Summary: We had a simple goal in developing this book: create quick and easy foolproof slow cooker recipes that taste as good as food prepared on the stovetop or in the oven. We also wanted to expand beyond the obvious slow-cooker recipes like soups and stews and develop satisfying casseroles, meatloaves, side dishes, desserts, and a variety of everyday basics that are handy to have around. Creating slow cooker recipes that were simply convenient wasn't going to cut it. We spent the better part of a year with 30 slow cookers going every day, and along the way we learned a lot about cooking with a slow cooker. The result is this revolutionary collection of recipes you'll really want to make. From easy-to-make lasagnas, satisfying pasta sauces, all sorts of enchilada and burrito fillings, kid-friendly macaroni and cheese and Sloppy Joes, to savory stratas, creamy polenta, and fudgy pudding cakes, these recipes offer appealing options whether you're cooking a weeknight dinner, making appetizers for a potluck, or juggling multiple dishes for the holidays. Throughout Slow Cooker Revolution you'll find recipes highlighted as "Easy Prep" for a quick turnaround before turning on the slow cooker. We were willing to try anything from frozen hash browns and frozen chopped onions, to jarred sauce and more, and we looked for tricks that delivered on both flavor and convenience. For great-tasting and almost no-prep slow-cooker meatballs, we used store-bought pesto (which gave the meatballs both texture and bright flavor, no chopping of onions or garlic required), and our favorite jarred pasta sauce. You'll find recipes for easy sides to round out your meals along with shopping and prep tips that will make your life even easier. A lifeline for busy cooks, these slow cooker recipes deliver on flavor and convenience, making it an essential addition to all home cook libraries. I am going to preface this review by stating that I don't usually like crockpot recipes. I'm not a big fan of casseroles or mushy food, and I much prefer leaner (and more expensive) pieces of meat which aren't used in a lot of slow cooker recipes. However, I always want to find slow cooker recipes that my family and I would enjoy because our busy lifestyle isn't conducive to cooking dinner every night. So over the past few months, I've seen some raving reviews for AMERICA'S TEST KITCHEN SLOW COOKER REVOLUTION: ONE TEST KITCHEN, 30 SLOW COOKERS, 200 AMAZING RECIPES around the blogosphere. I wanted to believe my friends, but I still wasn't entirely convinced that this cookbook would appeal to me so I checked it out from the library. I skimmed through it and was impressed that most of the ingredients were not out of a box or can; and I did find quite a few recipes that our entire family could (notice that I didn't say would) eat. (Finding recipes that my son can eat is quite a challenge given his life-threatening food allergies to egg, dairy, peanut, tree nut and shellfish.) I decided that I needed to have my very own copy of this book even if I only ever made the barbecue and rib recipes! 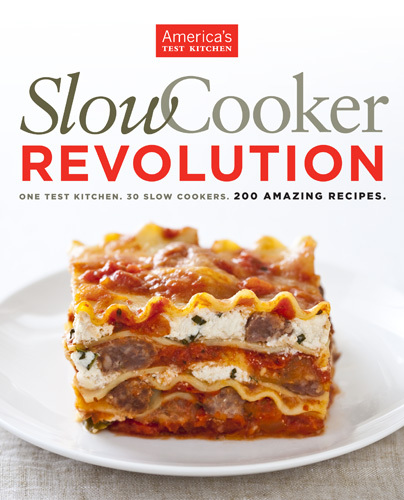 SLOW COOKER REVOLUTION is a terrific cookbook and actually a great slow cooker resource. The authors at America's Test Kitchen really seem to know their stuff. I absolutely loved how much advice they give in this cookbook along with explanations for some interesting ingredients (i.e. tomato paste in chicken soup?) 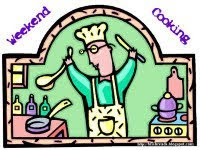 There are also lots of quick prep tips, smart shopping tips and side dish ideas. I especially liked how they explained the testing that occurred for each recipe. 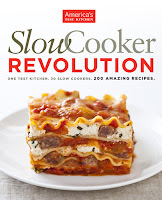 I will say that SLOW COOKER REVOLUTION does not have loads of quick and easy recipes, although there are a few. Some of the recipes require stove top work prior to placing the ingredients in the crockpot. In addition, some of the recipes require additional ingredients to be added near the end of the cooking time. I guess I was a bit surprised because I always associate slow cooker recipes to be "dump ingredients in crock pot and cook on low for 8-10 hours." The recipes in this cookbook are a little more work and a little more complex, but I have no doubt that they are better tasting than the traditional slow cooker recipes. The cookbook is divided into the following sections: Slow Cooker 101; Soups; Stews; Braises; Chilis; Barbecue Favorites and More; Pasta Sauces; Meatballs, Meatloaves, and More; Enchiladas, Tacos, and More; Casseroles; On the Side; Eggs and Brunch; Desserts; and Basics. I honestly don't think there was a section where I didn't find at least one recipe to try. I was a little worried that the lasagna's consistency would be runny and I'd have to serve it like a baked pasta. I shouldn't have feared... the authors had a way to prevent this. Prior to assembling the lasagna in the slow cooker, the chefs recommended lining it with aluminum foil and then making a foil sling. Basically this is a large piece of foil that you place in the crockpot and that hangs over the edges. This sling allows you to pick up the slightly cooled lasagna in one piece and serve. Pretty neat, huh? If my first try with a recipe in SLOW COOKER REVOLUTION is any indication, then this cookbook is sure to be one of my new favorites. Highly recommended for busy moms and anyone who enjoys using their slow cooker! I actually bought this cookbook. Who says that bloggers don't sell books? I quite like using the slow cooker. I might need to try and find this book to give it a try. I bought it too because of bloggers' recommendations. I haven't cooked out of it yet. Mr. BFR would love it if I made lasagna more often. Well, as Dawn says, you now are drinking the Koolaid! I've made probably a dozen recipes from this cookbook (including the lasagna!) and only one has been a thumbs down. They do all require a little bit more work but it is worth it! I need to get another crock pot to give this cookbook another go. I agree that the recipes in this book aren't quick and easy. I've heard many good things about this cookbook. I tend to use my crockpot more as a warmer. I should put it to more use! I bought this cookbook on the recommendations of other bloggers too. I agree that bloggers do sell books. I have bought many after reading bloggers reviews. I haven't cooked out of this book yet but plan to soon. I think these are more complex recipes for the slow cooker but if the end product tastes good, it is well worth it. Great review. Great review- This has been sitting in my "cart" for a while but I haven't pushed myself to buy it yet, wondering if it would really get me to use the slow cooker more often. I think your lasagna sold me- I HATE heating up the whole house to boil the water and turn on the oven. Thanks. I've made the mac & cheese w/tomato recipe, which also uses the foil backing. I don't use a crock pot much anymore now that it's just Hubby and I, but they are definitely the way to go for families and/or working moms. Thanks for the great review and testing a recipe first. Sounds like one I should invest in. You sold me with good lasagna without having to turn on the oven.